The Division One Tournament consisted of two groups, with pairs playing all of the other pairs in their group. The top pairs in each group played semi-finals with the winners contesting the final and the losers contesting a 3rd-place match. The pairs finishing 3rd in each group contested a 5th-place play-off and so on down through the groups. Thus every pair played at least one pair from the other group in a head-to-head to determine their overall finishing position. All games were the best of 3 games, with setting, using rally-points scoring. Group rankings were decided by the pair winning the most matches. Peter & Kelly Fairey won all their games in Group "A" fairly comfortably to book their place in the semi-finals. 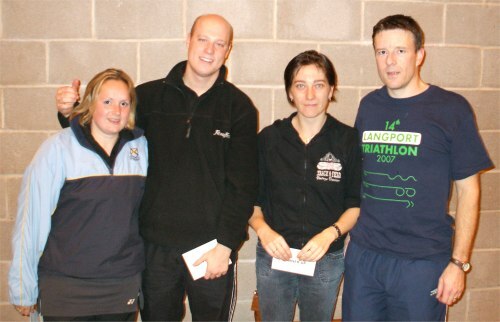 They were joined by Paul Ormes & Denise Thomas who had a scare against Andy Bentley & Jane Lipton but finished in 2nd place. In group "B" both Mark Yeandle & Debbie Gould and last year’s winners Barry Harriss & Fiona Dennis won all their matches with ease, so the only decision was who would come top and avoid Peter & Kelly in the semis. A close 3-setter went eventually to Barry & Fiona. The semi-finals went to form although Barry & Fiona struggled against Paul & Denise. The final was fought between the two Yeovil pairs and was deservedly won by Peter & Kelly who didn’t lose a game throughout the day. Barry & Fiona had had a couple of tough matches to reach the final and although they fought hard in the second set could not hold on to their trophy. A mention must be made of the 7th-place play-off match. Still on court long after all other matches had been completed, the final set of this epic went to Dave & Liz Osborne who beat Andy Bentley and Jane Lipton by the truly staggering score of 30-28 which is the highest recorded in the league since the adoption of rally-points scoring.